In today’s world, elearning has become almost synonymous with training/learning and development and most corporates and educational institutions deploy elearning courses on large scales. Therefore, it has become practically impossible to consider the learning style of each and every individual who will be audience to the course. There have been a number of studies in the past about VARK learners. According to one study, from a giving sample, about 42% are visual, 8% aural, 44% read/write and 6% are kinesthetic. There have also been gender studies in the area, trying to determine how men and women of various age groups learn and alter their learning styles constantly. But when it comes to elearning, most of this information isn’t helpful. Firstly, these studies though popular, lack scientific evidence as to prove their practical utility. The availability of vast amount literature on learning styles cannot in itself present accurate results that support the theory. There is no universal standard to prove that a certain learning style is best. The theory fails to prove that considering the learning styles and altering the teaching methodology according to the learner enhances learning or reduces the time taken in comprehension. Dearth of statistics and scientific data collected on this topic make it less worthy of time and money in the eLearning industry. Secondly, content directly affects the teaching methodology. It will highly depend on the content being taught and its complexity that primary and secondary presentation media are chosen. The type of content is a major factor in determining the increased or decreased use of aspects like graphics, audio, or text. Thirdly, since there is usually no face to face interaction between the learner and the designers, it becomes increasingly difficult to gauge the learning capacity of the learners and design a course accordingly without any concrete base for analysis. It would be more accurate to say that people have preferred methods of learning. whereas they may have to learn things using various methods depending upon the objective of that exercise. The objective of all training is to alter behaviour. However, the objective may range from spreading basic awareness to teaching how to operate a new system. 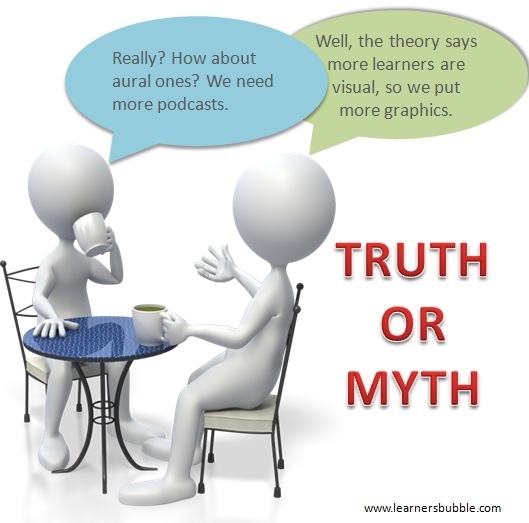 Both will have different approaches to get the information across to the learner. You don’t need simulations to spread awareness about a new company policy, you don’t even need a course for that. But this isn’t quite so in the latter case. Therefore, various teaching methodologies appeal to different senses of the learners, and they may have a preferred style of learning depending on the complexity of content. Learning styles do not form overnight. There are various internal and external factors like societal background and personal experiences respectively, that contributed towards a person developing his/her preferred learning style. To take these factors into consideration while designing a course for EVERY LEARNER…. until a breakthrough is next to impossible.